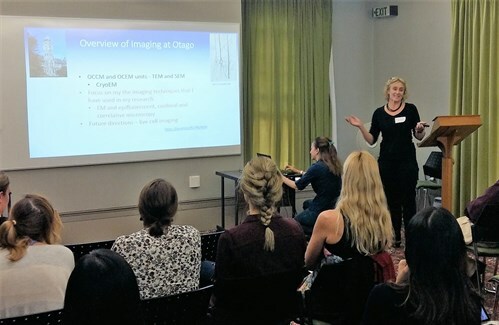 The MWC Early Career Research Committee recently organised a workshop designed to introduce young scientists from around the country to current microscopic and imaging techniques. The workshop at the University of Auckland on 30 April consisted of a series of short talks by experts from Otago, Victoria, Massey, and Auckland universities. 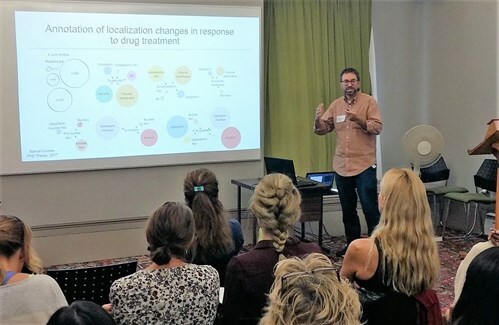 A range of topics were covered – from the latest microscopy technology and techniques, how New Zealand researchers can gain access to advanced equipment and facilities, to future directions in the field of microscopy. Dr Adele Woolley, University of Otago, presents on the future direction of microscopy at Otago. Dr Joanna Hicks, Chair of the MWC Early Career Research Committee based at the University of Waikato, said the committee was very pleased with the outcomes achieved by the workshop. “It was a great opportunity for young scientists to further their knowledge about microscopy and imaging techniques and to ask experts how the various available technologies could be applied to their research,” Dr Hicks said. Dr Andrew Munkacsi, Victoria University of Wellington, gives a talk on high-throughput confocal microscopy in yeast and mammalian cells.